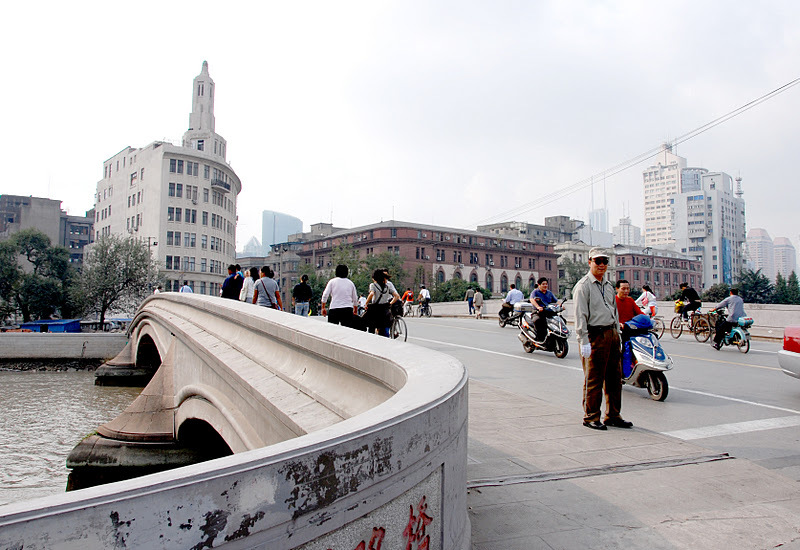 Continuing upstream along Suzhou Creek (in downtown Shanghai) is the Zhapu Road Bridge. It's a three span closed-spandrel arch bridge. I'm not sure how old it is, but I believe it predates WWII. At least Steven Spielberg filmed the bridge in his first WWII movie, Empire of the Sun. The 17 m wide bridge was used mostly by pedestrians, bicyclists, and motorcyclists until nearby bridge repairs and tunneling operations caused more vehicular traffic to drive onto the bridge. So much of Shanghai has been rebuilt in the last few years, that when I used a guidebook to look around the Old City, I found most of it was gone. Hopefully, the graceful Zhapu Bridge isn't also scheduled for demolition. Shanghai's Bridges: Zhapu Road Bridge by Mark Yashinsky is licensed under a Creative Commons Attribution-NonCommercial-ShareAlike 3.0 United States License.